For the sauce you need my Barbeque Sauce 2 recipe to glaze the ribs once they are cooked. It will give you plenty of sauce with some left overs. 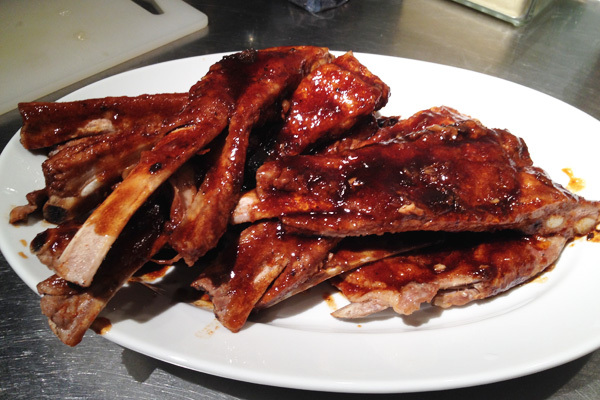 Spare Ribs - Who doesn't like sweet and sticky spare ribs. These are a staple at our house and weather they are the thin or thick variety we love spare ribs. 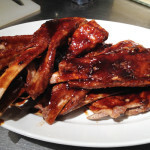 Braising them at a low temperature for a long time will give you beautiful moist and tender ribs. For the sauce you need my Barbeque Sauce 2 recipe to glaze the ribs once they are cooked. It will give you plenty of sauce with a little left over. 1-1½ kilo spare ribs these are the thin variety, see image. Take the ribs and trim and excess fat off. Sprinkle the rub on both sides of the rack of ribs and rub it into the meat well. Set aside in the roasting pan for an hour or more. When ready to cook, pour the vinegar and water over the ribs. Cover tightly with aluminum foil and braise in the oven for 1 and ½ hours. Braise in the lower part of the oven. Once cooked, remove to a cutting board and cut into individual ribs. Spoon over sauce to coat all the ribs and serve. Who doesn't like sweet and sticky spare ribs. These are a staple at our house and weather they are the thin or thick variety we love spare ribs. For the sauce you need my Barbeque Sauce 2 recipe to glaze the ribs once they are cooked. It will give you plenty of sauce with a little left over. Serve with rice and a salad or try my Cole Slaw recipe.